According to the United States Department of Agriculture, a healthy diet is one that Emphasizes fruits, vegetables, whole grains, and fat-free or low-fat milk and milk products; includes lean meats, poultry, fish, beans, eggs, and nuts; and is low in saturated fats, trans fats, cholesterol, salt (sodium), and added sugars. But just what minerals and nutrients are vital to our health and well-being? Consider these nutrient-dense foods when you’re looking to improve your vitamin and mineral intake. Vitamin A is needed for good eyesight and optimal functioning of the immune system. Cod liver oil, dairy products, sweet potatoes and dark green leafy vegetables are all great natural food sources of vitamin A.
Vitamin B1, also known as thiamin, is imperative to the body’s ability to process carbohydrates. Whole grain breads, cereals and pastas have high amounts of thiamin. Riboflavin, or B2, can be found in fortified cereals, almonds, asparagus, eggs, and meat. It’s used in many body processes, including converting food into energy and the production of red blood cells. Niacin, also known as B3, can be found in lean chicken, tuna, salmon, turkey, enriched flour, peanuts, and fortified cereals. It aids in digestion and also plays a key role in converting food into energy. Vitamin B6 can be found in fortified cereals, fortified soy-based meat substitutes, baked potatoes with skin, bananas, light-meat chicken and turkey, eggs, and spinach. It’s vital for a healthy nervous system, and helps break down proteins and stored sugars. Vitamin B12 is needed for creating red blood cells, and can be found in beef, clams, mussels, crabs, salmon, poultry, and soybeans. Citrus fruits, red berries, tomatoes, potatoes, broccoli, cauliflower, Brussels sprouts, red and green bell peppers, cabbage, and spinach are all loaded with vitamin C, which is vital to promoting a healthy immune system, and making chemical messengers in the brain. Vitamin D can be found in fortified milk, cheese, and cereals; egg yolks; salmon; but can also be made by the body from sunlight exposure. It’s needed to process calcium and maintain the health of bones and teeth. Vitamin E functions as an antioxidant and is essential to your skin’s good health. Eat plenty of leafy green vegetables, almonds, hazelnuts, and vegetable oils like sunflower, canola, and soybean to get this vital nutrient. Folic acid can be found in fortified cereals and grain products; lima, lentil, and garbanzo beans; and dark leafy vegetables. It’s vital for cell development, prevents birth defects, promotes heart health, and helps red blood cells form. Pregnant women need to take special care to ensure they are getting enough of this for themselves and their developing baby. Iron can be found in leafy green vegetables, beans, shellfish, red meat, poultry, soy foods, and some fortified foods. It’s needed to transport oxygen to all parts of the body via the red blood cells. Essential fatty acids play a part in many metabolic processes, and there is evidence to suggest that low levels of essential fatty acids, or the wrong balance of types among the essential fatty acids, may be a factor in a number of illnesses. Good sources are fish and shellfish, flaxseed, canola oil, pumpkin seeds, sunflower seeds, leafy vegetables, and walnuts. Though this list is far from complete, it gives a good base of knowledge on which to build a healthy, well-balanced diet. One of the best things you can do do improve your overall health and well-being is to change your eating habits and become a healthy eater. Ultimately, being a healthy eater means becoming informed about what healthy eating really is so you can make smart choices. It isn’t about analyzing food labels, calculating grams of fat, and calorie counting. Instead, healthy eating focuses on sensible eating which includes having healthy meals at least 3 times daily. The truth is, most healthy eaters enjoy a wide assortment of foods, not restricting themselves to one specific food group. Certainly, there are going to be times and occasions when you eat way too much, skip meals, or eat foods that are less good for you. Even so, you would be wise to power your body routinely with the right amount of food to keep both your body and mind strong and alert. Quite often, bad eating habits spill over into other areas of life. When someone is struggling and unable to take control over their eating, they are also more likely to spin out of control with other aspects of life as well. For example, they could wind up overspending, talking too much, staying up late too often; not really able to control much of anything they do. By contrast, those concerned about taking care of their health tend to form all around good habits. For one thing, a healthy eater is generally a good problem solver too. Most have learned to take care of themselves and make good decisions about their eating habits. They are invariably aware of what they eat, and know the effect that it’s going to have on their bodies. If you have thought about making your own life much better, healthy eating is just the place to start. It is best to remember that restricting food is more difficult than choosing to eat right. Make eating healthy a chosen lifestyle, something that you can do to supercharge your body and be at your best! It cannot be stressed enough how important a balanced healthy diet is. The foods you put into your body will certainly have a major impact on how you look and feel. This is just the way it works. In other words, you haver to eat healthy if you want to look your best, and stay in great shape. It is really not that difficult to incorporate a balanced healthy diet into your life. You just have to be willing to get started. Once you get used to it, you will love it! What is a balanced healthy diet? This is an excellent question, and different people or experts are likely to tell you slightly different things. Basically, a balanced diet consists of certain foods that can give you all of the vitamins and minerals you need in order to stay healthy and fit. Some of the foods you should focus on are all-natural or organic fruits and vegetables. By making sure they are organic, you are making sure you do not eat pesticides. Naturally you do not want these. Shoot for five to eight servings of vegetables and fruits each day, which is what’s recommended. You should also consider whole grains if you wish to be healthy. These are very important for sustained energy, good carbohydrates, and regularity. The more fiber you consume, the more regular you will be. While you may not consider this important, it is imperative. With a good balanced healthy diet, you can keep your colon flushed out, which is not only great for your digestive tract, but it is also wonderful for your skin. A healthy colon means a healthy complexion. So, eat plenty of whole grain rice, oatmeal, whole wheat pasta, and whole wheat or whole grain breads. Avoid white breads and carbs. As for protein, you definitely need at least 50 grams of protein each day in your balanced healthy diet. You can acquire this from lean meats like fish, skinless chicken breast, tuna, and beans. If you are a vegan, you may have to get a lot of your protein from soy products and beans. These are very healthy as well. If you are not a vegetarian, you should consider protein sources like egg whites, skim milk, low-fat cheese, and lean cuts of beef on occasion. These are all great sources of protein, and are certainly part of a balanced healthy diet plan. That pretty much sums up the basics of a balanced healthy diet. It is simple enough for you to get started with yours today. Even with all the hype about fad diets and revolutionary new weight-loss plans, eating healthy and exercising is still the best way to lose weight and stay in shape. A healthy diet will not only get you to a healthy weight level, it would also decrease your risk of premature aging, heart disease, vascular diseases such as strokes, and even certain cancers. There are, of course, weight loss diets that will get you where you want to go faster, but many of them will not help you keep the weight off. The key is to find a healthy diet that you can stick with your whole life. If you start with an extreme fad diet, once you quit it you will put the weight back on. Similarly, your healthy living program needs to stress exercises you can stick with. You can plan on training for a marathon, using the latest exercise machines or taking aerobic classes seven days a week, but if you aren’t actually going to do it, it won’t do you any good. Rather than setting your goals high, set your goals are reasonable level. Start by taking an easy walk for 20 minutes or so every day, then work your way up to more vigorous exercises. Improve your diet by cutting your food portions gradually over time, reducing the amount of red meat you are eating and increasing your intake of grains and vegetables. Gradually, refine your healthy diet and take your exercise routine up a notch. Eventually, you will get where you want to go. Of course, eating healthy and exercising starts with educating yourself about what is required for good diet and effective workouts. Study the food pyramid and use it to plan out your meals. Most of your caloric intake should come from vegetables and fruits. You should also eat a lot of whole grains. Eat less protein and stress lean proteins such as chicken and fish. Eat very little processed food and stay away from fatty and sugar-filled snacks. You should also educate yourself about exercise. The American Heart Association recommends 30 minutes of moderately intense exercise five days each week. If you aren’t exercising yet, don’t feel like you have to do exactly what they say right away. Instead, work your way up to their goal at a pace that feels right for you. As long as you get there eventually, it doesn’t matter if it takes you a few weeks or even a few months of lower-intensity exercise. As long as you are always making progress towards eating healthy and exercising, you should feel proud of yourself. Above all else, healthy eating requires the right attitude. Sure, preparation is part of it and so is determination, but really there’s no substitute for attitude. For some, that might mean a new perspective. People into healthy diets either go to too great an extreme or don’t do enough. Everyone is so freaked out about the idea of unhealthy foods that either they ignore it completely or panic over it. The truth is that you don’t have to do either. Eating healthy foods in general and treats in moderation is good enough. You want to create a diet that you can live with day in and day out for years. You can have treats now and then, but a treat shouldn’t be a whole meal. Health eating means that, if for example you are having desert, you should have a small ones. The rest of your meal should be as healthy or even more healthy than usual. If you’re going to have a fatty main course, you should eat well for the rest of the day. Basically, only having one treated at a time and treats only once or twice a week is the best way to keep a healthy diet up. One of the most overlooked aspects of healthy eating is community. Eating healthy is a significant lifestyle choice. It isn’t simply a matter of making and eating meals. It requires you to keep your resolution on a daily basis, and sometimes that requires the right community. If you can get your housemates, family members, or friends to commit to healthy eating with you, you’ll have a much better chance of success. After all, eating is a social activity in our society. If you are constantly surrounded by people who eat junk food, it will be difficult or impossible for you to keep your healthy eating habits going. Above all the most important thing to remember when you eat healthy is to keep your mind focused. You will screw up once in awhile. You will give in to temptation when you shouldn’t, or will fail to adequately plan your meals ahead of time and have to get some kind of junk on the road. Persevere. Just because you messed up once doesn’t mean you should give up altogether! We are constantly hearing about how people need to lose weight in a healthy way, but what exactly is considered healthy weight loss? Weight loss is a topic that interests a lot of people these days. I have heard a couple of different answers from doctors, nutritionists and personal trainers, so I am not really sure what to believe. I have always felt that if you are following a diet and exercise routine where you are taking in at least 1,400 to 1,600 calories per day and exercising for at least 30 to 60 minutes a day, regardless of how much weight you lose you are probably pretty healthy. Not everyone feels this way, though. Some diet plans are absolutely strict about the weight loss food you are supposed to eat. I had a doctor tell me that healthy weight loss is considered to be one to two pounds a week. 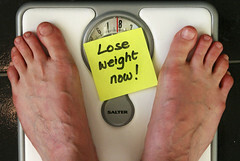 He said that anything more than that is not really conducive to permanent weight loss. He said that dieting should adopted slowly and exercise should be done in moderation. I took what he said to heart, and when I lost 70 pounds about 10 years ago, I did not lose more than two pounds a week, and if I saw myself starting to go over that amount, I would slow down on the workouts and dieting. Listening to my body was essential for my own healthy diet plan. I gained about 50 of it back when I started a job where I was pretty sedentary and knew that I would have to take it back off again. Fortunately, even though the job was pretty sedentary, I was able to hire a personal trainer who informed me that I could lose as much as one percent of my body weight each week and that would be fine. I was in the high 200’s at this point, so I knew that I could start out with about 2.75 pounds per week and would be fine. I was, and I have never had any health issues because of that. On the other hand, the contestants on the popular reality show The Biggest Loser can lose 10 to 15 pounds per week and often do so. It has to be healthy weight loss, otherwise the trainers on the show would say so, but one thing the show makes sure to emphasize is the fact that the contestants are under constant medical supervision and go through recovery periods after each workout, where they are iced down, receive massages and so forth to reduce any sort of trauma done to their bodies. So what is considered healthy weight loss? I guess it just depends on who you ask. I would say that keeping it to a three or four pounds maximum each week would be acceptable, but somebody else might tell you to shoot for a lower amount.